A number of brides I’ve had in the past have been the same or close to the same height as their groom, so they wore flats for their ceremony and formal portraits but had a SECOND, prettier pair to show up in their detail pictures or poses with their family and bridesmaids. Most slippers or flats won’t have quite the same photogenic appeal as a formal shoe, so bringing along a second pair is a pretty smart way to class up your wedding album. There are definitely exceptions to this, so the main thing is just to make sure you have a pair of shoes you’re happy to have photographed with the rest of your details! Detail shots are important, but there are also a couple more practical reasons to think about: first, wedding days can be 8-12+ hours long and by the time you make it to your reception, anything to help you get more comfortable so you can just relax and enjoy the celebration is a major bonus. 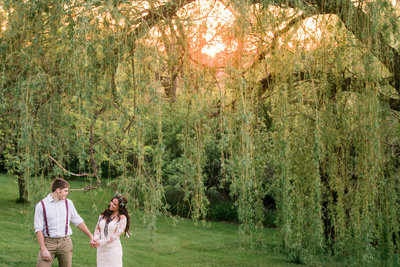 Second, as much as possible, we take your pictures outdoors in the natural, beautiful light outside. This occasionally can mean a bit of hiking or walking over dirt roads or wet grass to get to a winner location (totally worth it for that stunner background, trust me)! Usually this is very minimal and easy to keep off your dress, but heels and soft ground don’t go together so well, so bringing along a second pair of shoes keeps you comfortable walking around outside, but classy and fresh when we return indoors. I’ll be posting more tips in the “Tips + Tricks for Brides” category on the lefthand side of my blog this year, so if you have any questions post them below for me!